Chiapas: Manuel Velasco Coello, from governor to senator to substitute governor. Just on August 29, Manuel Velasco had requested a license as governor of Chiapas to be able to take oath as a senator of the Republic, since he was selected as such by the principle of proportional representation for the Green Ecologist Party of Mexico (PVEM), even entering as coordinator of said party in the legislative body, and despite having been integrated at the last moment into the list. Days before, the Congress of Chiapas modified constitutional articles 45, 52, 55 and 56 opening the possibility for him to return to the government of Chiapas for a few months, until December 8 when the governor-elect in the elections of the past first July, Rutilio Escandón Cadenas, will assume this position. The Constitution of Chiapas before its modification made it clear that the governor could quit only for serious reasons and it prevented that an interim governor, who has been governor in the same period, could return to his position. On September 4, the Senate endorsed Velasco’s license to leave his position as legislator for an indefinite period. In a first attempt, this possibility had been rejected by the plenary, although after that the Political Coordination Board approved to modify the agenda, to allow a second vote in which 82 votes in favor were registered, 31 against and 4 abstentions. In a discussion that lasted four hours, several senators defended license applications as an inalienable right of any legislator. Gustavo Madero, of the National Action Party (PAN), criticized that the issue of the license was discussed twice in the same session: “Let’s not start the fourth transformation by denting the prestige of the Senate. Although it’s two documents, it’s the same issue. What we are seeing is a license application twice. We are going to be here for six years and we are going to remember that in our first session we voted on the same issue in two directions “. For her part, Senator Blanca Estela Piña Gudiño, from Morena said: “The modifications approved in Chiapas represent a new excess against the citizenship, since these reforms are made as a suit tailored to benefit Manuel Velasco Coello, this is also a sign that the will of the people of Mexico has not been fully understood ». In previous days, the Coparmex of Chiapas had criticized the possibility that Velasco might return to the State Government and assured that the way of proceeding of the Congress represented an affront to the democratic and institutional life of the state. On the other hand, about a thousand people among activists, human rights defenders, normal students, displaced indigenous people, businessmen and trade unionists protested in front of the local Congress against the constitutional reforms that allowed the governor Manuel Velasco Coello to leave office, go to the Senate and go back to finish his six-year term. The protesters asked for a political trial against Velasco and that he account for the resources handled during his six-year term. The fact is that the license was granted and Velasco’s place in the Senate will be occupied by Enrique Murat Hinojosa (son of the ex-governor of Oaxaca, José Murat), who was appointed as his substitute. Several analysts have indicated that the vote in favor of this license was given in exchange for the Green Party to transferred to 5 deputies to Morena, led by the elected president, Andrés Manuel López Obrador, allowing this later to consolidate an absolute majority in the Chamber. of Deputies (with 252 legislators). However, Ricardo Monreal, leader of Morena in the Senate, assured that there were no agreements with the Green Party. Velasco affirmed that “I made the decision to return to Chiapas to face and fulfill my assignment until the last minute of December 8. I made the decision to assume my responsibility as Governor to close well the state administration and to promote a successful and beneficial government transition for my state”. On July 19th, more than three million people from Chiapas voted to elect 122 majors and their staff members and 41 local deputies. Of the planned six thousand voting booths, 97% were installed. The Green Ecologist Party of Mexico (PVEM) and the Institutional Revolutionary Party (PRI) won in 91 of the 122 towns of Chiapas, according to the Program of Preliminary Electoral Results (PREP). The PVEM and the PRI are maintaining the same number of towns that they govern at the present time. United Chiapas and Move Chiapas, sponsored by the local governments, will administer 18 towns. The MORENA Party did not win anywhere, according to the PREP. 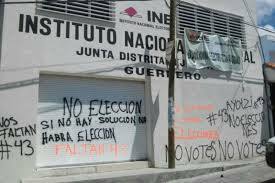 The Institution of Elections and Citizen Participation (IEPC) reported on the burning and robbery of four voting booths in the town of Las Margaritas and on the robbery of two voting booths located in the section La Hacienda in the capital city of Tuxtla Gutiérrez. In two communities of Tila the voting booths could not be installed due to fighting during the last few days. In Pueblo Nuevo Solistahaucan an armed group stole the ballots of 4 voting booths and filled them with artificially marked ballots. The conselors of IEPC confirmed that nn Chenalhó, the electoral process was temporarily suspended because the ballots were not completed. 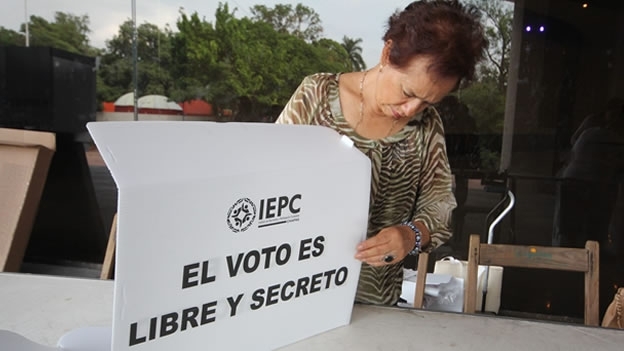 According to the executive direct of the IEPC Jesus Moscoso Lorenca, in Ocosingo five voting booths were not installed for security reasons. In Venustiano Carranza the District Counsel had been taken and the protestors threatened to burn the building down. In Suchiate a voting booth had to be closed down because the people that had been registered there were migrants that received their birth certificates from the Civil Registry that had to be closed down for selling birth certificates. On Sunday, June 7, 2015, more than 83 million Mexicans voted for 1,996 public offices, including 9 governorships, 500 federal deputies, and hundreds of local offices in different states of the Republic. A week after the elections, upon finalizing the calculation of votes, the National Electoral Institute (INE) reported that the deputies chosen by direct votes and proportional representation within the Chamber of Deputies would include 203 seats for the PRI (which will retain the majority vote), 108 for the PAN, 56 for PRD, 47 for the Green Ecologist Party (PVEM), 35 for MORENA, 26 for the Citizens’ Movement, 8 for Social Encounter, 10 for New Alliance (PANAL), and 6 for the Labor Party (PT). 41% of the offices will be held by women. The election registered a participation of 47.72% of eligible voters, while the percentage of blank votes reached 4.76% of the total. With a margin of 41%, the preliminary results of the Guerrero State elections place the PRI-PVEM candidate, Héctor Astudillo Flores, as the winner. 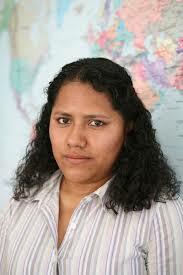 Astudillo gained 465 mil 263 votes, 7% more than his most popular rival, the PRD-PT candidate, Beatriz Mojica Morga. The candidate for the Citizens’ Movement (MC), Luis Walton Aburto, took third place, with 91,651 votes. Beyond these, comes the National Action Party candidate (PAN), Jorge Camacho Peñaloza (58,005 votes); the MORENA candidate, Pablo Amílcar Sandoval (30,355 votes), and the New Alliance Party (PANAL), Karime Sevilla (19,625 votes). In the mayorships, the PRI took 36, the PRD 24, the MC 7, the PAN 4, and the PT and PVEM 2 each, with PANAL taking 1. According to these results, the PRI will retake control of Acapulco, Iguala, and Tixtla, and it will maintain power in Chilpancingo, Taxco, and Chilapa, while the PRD will continue to govern in Zihuatanejo and Cocula, and it will recover Ayutla and Metlatónoc. On election day, the process took place within a violent context in many parts of the state. 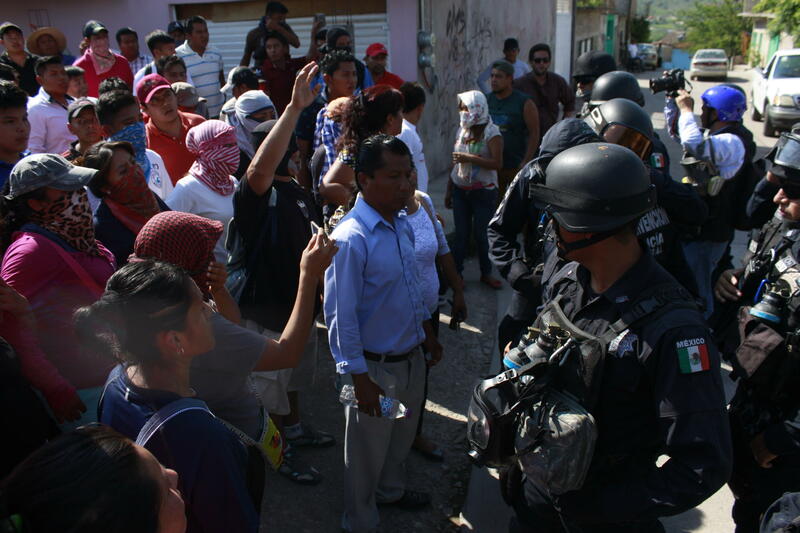 In Tlapa de Comonfort, police and soldiers attacked citizens (including two women and a girl) who had kidnapped federal officials, whom they wanted to exchange for 9 imprisoned teachers. The group was arrested by the authorities at the headquarters of the State Coordination of Educational Workers of Guerrero (CETEG) and one house in particular. Abel Barrera, director of the Tlachinollan Mountain Center for Human Rights, arrived to the site to mediate a dialogue and interchange between the arrested teachers, who had been transferred by helicopter to Mexico City, and the federal officials. Barrera reported that the Secretary for Governance had accepted the exchange, but that the teachers would be handed over in Chilpancingo. Nonetheless, at night, federal police fired tear gas and live ammunition at the citizenry to disperse them. One youth died by gunfire for this reason. A day before the elections were held, Saturday 6 June, there was a confrontation involving members of the United Front for Security and Social Development in Guerrero (FUSDEG) in a rural zone of the Acapulco municipality which left 16 dead and an unspecified number of injured. Nonetheless, the mayor, Luis Uruñuela, expressed that the events do not have to do with the elections, and he claimed that the State Attorney General would investigate the incident. On June 7, together with the rest of the country, federal congressional elections took place in Chiapas. The environment in the days running up to the elections was marked by tensions resulting from the violent protests that members of the National Coordination of Educational Workers (CNTE) had been carrying out since the beginning of June in the capital city of Tuxtla Gutiérrez, together with its announcement of their boycott of the elections. To guarantee that elections be held, the Secretary of Governance announced on June 6 the deployment of federal forces in Chiapas, Oaxaca, Guerrero, and Michoacán. In the specific case of Chiapas, reports indicated at least 18,000 soldiers and federal police arrived. At the end of the day, the General Secretary for Governance, Juan Carlos Gómez Aranda, stressed that the elections had taken place under normal conditions in Chiapas, though he recognizes that some “incidents” had been seen, though according to him, these neither threatened the elections nor the social stability of the state. Within these “incidents,” not all the voting booths could be installed, and 35 ballots and electoral documents were burned in Ocosingo, Chilón, Venustiano Carranza, Comitán, Salto de Agua, Chiapa de Corzo, Huehuetán, and Tuxtla. The CNTE has distanced itself from these actions. 92% of the reporting results suggested the following outcomes: 46.5% of the eligible population abstained, while 5.8% submitted blank votes. This implies that at least half declared themselves for one candidate or another. The rest of the voting gave a clear victory to the alliance between the Institutional Revolutionary Party (PRI) and the Green Ecologist Party of Mexico (PVEM), whose candidates triumphed in the 12 districts comprising the state, obtaining 69.4% of the voters. In net terms, the PVEM consolidated itself as the primary political force, after it received 45.6% of the votes. MORENA took third place, with approximately 6% in favor. It should be recalled that, in the case of Chiapas, there will be new elections on July 19 for local congressional positions (24 legislators by majority vote and 17 by proportion) and 122 mayorships. Valentina Rosendo Cantú has renounced her candidacy for the National Regeneration Movement (MORENA, led by Andrés Manuel López Obrador) for the mayorship of Acatepec, after she received death-threats and suffered a motor-vehicle accident that she qualified as an attack on her person. On 10 May, she was followed on the highway that leads to Tlapa de Comomfort, and for this reason had an accident. Pablo Amílcar Sandoval Ballesteros, the MORENA candidate for Guerrero state, reported the decision. It should be recalled that Valentina Rosendo Cantú is an indigenous woman who was raped in 2000 by Army soldiers in the Ayutla de los Libres municipalities. In 2010, the Inter-American Court on Human Rights sentenced the Mexican State in the case, and demanded compensation for damages, and ordered an adequate investigation and punishment for those responsible, among other dictates. On 1 May, a group of hitmen murdered Ulises Fabián Quiroz, the Institutional Revolutionary Party’s (PRI) candidate for the mayorship of Chilapa in the forthcoming elections planned for 7 June. José Santos Valdivia, the substitute choice for the PRI-Green alliance for the same office, refused to continue with the electoral campaign. The candidate for the Movement for National Regeneration (MORENA), Laura Patricia Hernández Carrillo, had just announced days before that she would be suspending her candidacy for security reasons. Also in April, the gubernatorial candidate for the Citizens’ Movement (MC), Luis Walton Aburto, cancelled his proselytizing tour in the Mountain region, after he had been intercepted together with his cabinet by an armed group in the municipal center of Chilapa de Álvarez. In mid-March, Aidé Nava González, candidate of the Party for Democratic Revolution (PRD) for the mayorship of Ahuacuotzingo, located below the Mountain region, was found dead in the surroundings of the Tecoanapa community, near where she had been taken by armed subjects days prior. To date, the authorities believe these violent acts to be localized, and that there still exist the adequate conditions for elections next month.